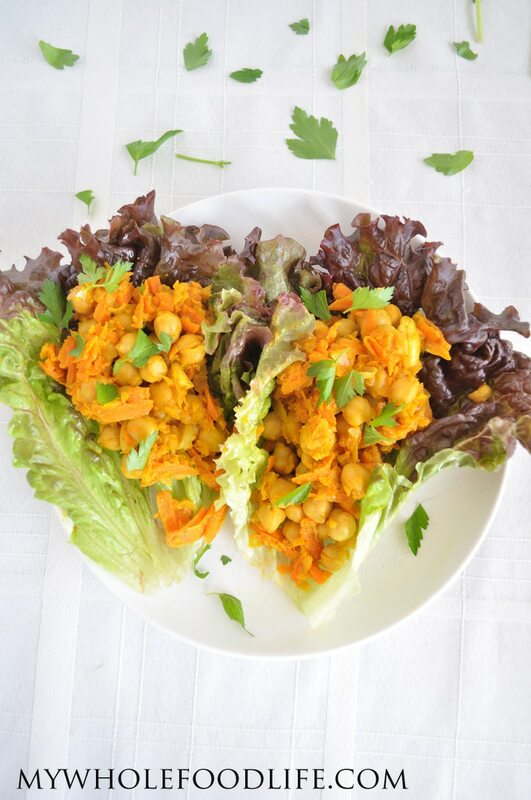 Chickpea Curry Lettuce Wraps. I love curry dishes. Do you? Last night I got the idea to do a chickpea curry. I already have a pumpkin coconut curry on my blog. Since I love chickpeas, I really wanted to include chickpeas in a curry dish. That is how these healthy lettuce wraps were born. I decided to put my chickpea curry in lettuce wraps. So I sent my husband to the store for romaine lettuce. He came back with this red leaf lettuce you see pictured. I think the red leaf lettuce worked fine, but I wanted to let you all know my original vision was a romaine lettuce wrap. Honestly, I think this chickpea curry is great on it’s own, or in the lettuce wrap. It’s a great way to get some turmeric in your diet too. This dish is vegan and gluten free. I hope you enjoy it. A healthy meal ready in under 30 minutes! In a large saute pan , on medium heat, combine the oil, garlic and onions. Cover and let cook for about 5-7 minutes, stirring occasionally. Then add in the carrots and spices and saute for another 5 minutes. Lastly add in the chickpeas, cashews and the coconut milk and simmer another couple minutes. Serve on lettuce wraps or eat it as is! This curry should last at least a week in the fridge. It can also be frozen for longer. Enjoy!